Mobile developers are increasingly focusing on engaging repeat customers rather than chasing sales of apps to new users, according to a new survey of developers. It’s a natural outgrowth of the explosion of the apps marketplace, which is nearly impossible to stand out in anymore, with more than 425,000 apps in the iOS App Store (s AAPL) and 250,000 in the Android Market (s GOOG) alone. 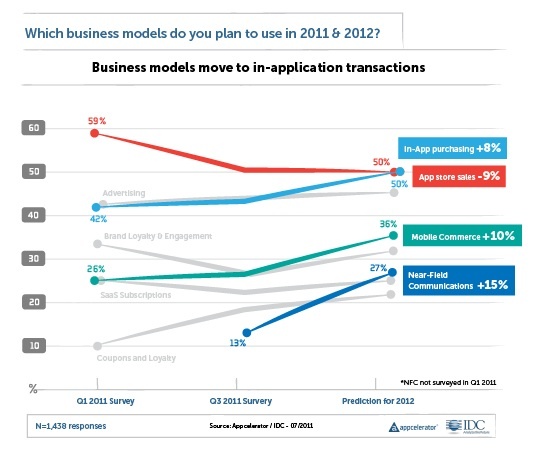 Just over 2,000 developers were surveyed by IDC and Appcelerator between July 20 and 21, and just about half of them said pure sales of apps was the primary strategy driving their business model. That’s down about nine percent from Appcelerator developers surveyed six months ago. At the same time, the percentage of those who said in-app purchasing was a major factor in their moneymaking strategy inched up slightly from 42 percent to 43 percent. While that change is pretty negligible right now, looking ahead to next year, 50 percent of those surveyed say in-app purchasing will be the most important strategy, tying with app store sales. And that would be a fairly significant change. More and more apps “are becoming vehicles for constant engagement, cloud connectivity and reusable utilities,” said Scott Schwarzhoff, vice president of marketing for Appcelerator, which besides conducting the survey, has a platform to help developers transition from the web to mobile apps. Another important part of developers’ evolving strategies for making money with their apps? Mobile commerce. The survey found that the importance of mcommerce will rise from 28 percent now to 36 percent in the next year, and services related to near-field communication, or NFC, will grow from 13 percent now to 27 percent over the next year, the survey found. So it’s not a coincidence that the same survey found that the platform these same developers are most interested in creating apps for, iOS (91 percent say iPhone is their target platform) have the kinds of features that consistently drive people back to using apps repeatedly: iOS 5’s improved notifications, iCloud, integration of Twitter, reminders and iMessage. All of these features are designed to more easily nudge users back into apps rather than relying on them to remember they downloaded something specific. These coming improvements to iOS–scheduled to arrive sometime this fall–are “the key” to developers’ evolving way of looking at apps, said Schwarzhoff. Because, he says, “getting new users off the App Store is kind of a pain and kind of expensive.” Many developers are “counting on these new tools to keep their audience engaged.” This is a critical shift for app makers because repeat users who are engaged tend to respond better to ads an are more likely to make in-app purchases. It’s also interesting to note how much developers surveyed are counting on the popularity of mobile payments picking up. They have growing expectations for NFC and mobile commerce for making money, yet right now the mobile commerce world at least in the U.S. is still pretty chaotic with no clear leader or standard yet emerged, and there are not more than a few phones for the U.S. that even have NFC chips enabled. Plus, a recent Consumer Reports survey found consumers aren’t completely sold on the concept of paying with their phones just yet. For more of the survey’s findings, see Appcelerator. There are better alternatives. GiveMeApps doesn’t charge developer fees, and gives developers 100% of their profits. They also help market your app with reviews, have customizable store fronts with social media tools and blog/news feeds to help you do business, all with an active forum to boot. Check them out. GiveMeApps.